A term used by Nike to describe outsoles allegedly less susceptible to wearing out. Usually associated with a logo featuring a SWOOSH encircled by an eight-tooth gear. Usually seen on basketball shoes and hiking boots. 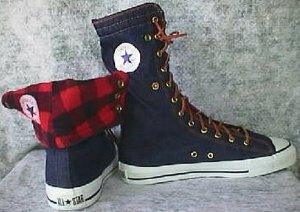 A version of the Converse "Chuck Taylor" All Star that is even higher than the traditional high-top. Converse produced the NEEHI in the 1985 to 1987 era. Note the snaps along the side that allow folding the NEEHI down to "merely" high-top level. Some New Balance styles (like this one) are imported from the Far East. 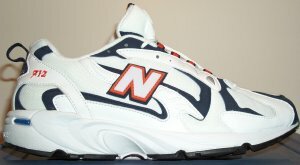 Other New Balance styles (like this one) are made in the United States ("of domestic and imported materials," according to the label in the tongue). No snazzy names (like Nike); just a model number. The shoe with the "N" on the side: It's a New Balance; NEVER a Nike! Certain Nike styles have the letter "N" on the back of the shoe. STORE SHOPPING TIP: To determine the approximate price of a New Balance shoe in United States dollars, divide the digits in the model number by 10. One can use a similar trick with the numbers in a Lexus model: but in this case, multiply by $100. Former US President Bill Clinton has at least one pair. New Balance started business as a maker of orthopedic footwear and they decided they could make better athletic shoes what the competition sold. An original vintage sneaker that is still on the store shelf... they get put in the back room when they don't sell and turn up years later! Compare to Reissue. The corporate flagship brand of athletic shoes designed, developed, and marketed by NIKE, Inc.. Nike shoes feature the familiar SWOOSH logo. A Nike design philosophy started with certain styles in 2005. The Nike Considered design philosophy simplified shoe recycling, while minimizing the use of energy and toxic chemicals. Some styles were partially made of recycled materials, while others incorporated hemp fabric. Nike integrated the "lessons learned" throughout their entire line starting in 2008. A subsidiary of Nike, Inc. that makes plastic products. 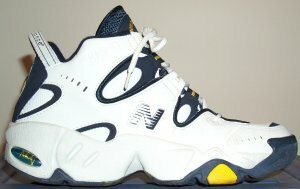 They are best known as the source for Nike AIR subsystems (IHM = "In-House Manufacturing"). The largest designer, developer, and marketer of high-end athletic shoes on Earth. NIKE, Inc. (stock ticker symbol: NKE) was co-founded by Bill Bowerman and Philip Knight and headquartered in Beaverton, Oregon, USA. To properly pronounce "Nike," rhyme it with "Mikey." Nike is generally the market leader for each category of athletic shoes; possible exceptions include certain markets, such as ASICS for wrestling shoes and adidas for soccer boots. Nike was named after the Greek goddess of victory; Nike is also the Greek word for victory. So, if you hear "NIKE" shouted at a Greek athletic event, it's not part of the advertising. Other brands in the Nike corporate stable include Converse, Hurley International, and the JORDAN Brand. An unpleasant condition caused by wear of the knee joint, sometimes experienced by runners who use excessively cushioned athletic shoes. Not necessarily tied to Nike products, but frequently associated with them. For those who like reading The Merck Manual, the formal term is "chondromalacia of the patella." A 1999 sport sandal style from Nike. The name implies that somebody was brainwashed in Beaverton to demand a Swoosh on their sport sandals, trivializing Teva. Somebody (not Charlie) liked the name... Nike brought out a Rinse II in 2000, but they gave up in 2001. I (Charlie) get questions from time to time about how to determine the age of a Nike athletic shoe. 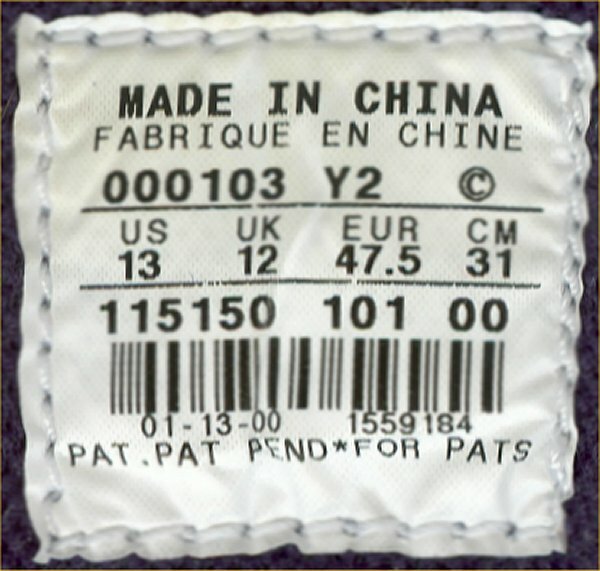 They invariably have a date label in the shoe (either sewed to the back of the tongue as in this example, or on the side, or occasionally printed on the ankle collar) that gives the date of manufacture: two digits for year, two digits for the starting month of production, two digits for the ending month of production. 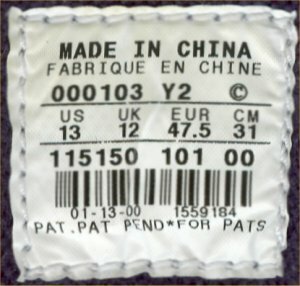 For example, the date label to the left is from a shoe that was produced from January to March 2000. If the ending month is less than the starting month, this indicates that manufacturing started at the end of one year and continued in the succeeding year. Athletic shoe maker that exists only in the mind of people who wear addidas, ASSICS, or Reebox. A somewhat inert gas that is the largest single component of the atmosphere (approximately 78%). Used in athletic shoe cushioning systems by Nike and Ryka. The NYSE stock ticker symbol for NIKE, Inc. The classic Tretorn tennis sneaker model.